Five hundred odd years since Shakespeare died, and we still can’t get enough of his plays. You can’t swing a plastic skull without hitting a Shakespeare production up and down this sceptred isle. Maybe it’s the assurance that you know what you’re getting, you know you never have worry about the quality of the script with a Shakespeare play. Sure his plots can go a little awol, some of his storylines are a little dated, but the man knew how to put quill to parchment. With every new production, it all hinges on the acting and, to a lesser – though still crucial – extent, the setting. The National Theatre’s much praised production of Othello moves the action to modern times, opening with Iago outside a Wetherspoons-a-like pub, moving to a stark cabinet boardroom as the big cheeses of Venice discuss the Turkish problem, before the action turns to Cyprus where Othello is heading up an operation in a modern day British army base. (Confusingly, I think we’re still meant to believe the soldiers are Italian, although there’s little of the Mediterranean about this lager swilling bunch, especially as they’re dressed as, erm, British soldiers). The modern day setting mostly works well, ramping up the machismo and exposing the volatile life of a soldier on active – and so often, inactive – service. There are times when it jars slightly; awaiting the arrival of Othello in Cyprus, it sounded incongruous hearing squaddies talking of ‘tempests’. Then there’s the issue of a contemporary setting bringing into sharp relief some of Shakespeare’s 17th century absurdities; this production certainly highlights Othello’s irrational, ridiculous, overly-macho behaviour. Why, why, why doesn’t he just confront Desdemona, or take Cassio out for a pint to talk things over? Why does he believe everything his friend Iago tells him unquestioningly? Why do four people die because of a misplaced handkerchief? But in the final horrible scene when Othello has killed his innocent wife in a jealous rage, he says, in answer to Lodovico “For nought I did in hate, but all in honour” it reminded me that there are still two women a week in this country killed by their partners and the perpetrators’ excuses are equally as flimsy, and certainly less articulate, as Othello’s. And with recent ‘honour killings’ making headlines, “an honourable murderer, if you will” is still enough of a reason to murder for some. As is so often the case, the devil gets the best lines. Iago must be a joy to play for any actor, he’s so wonderfully two-faced, so slimy, so magnificient at lying. All his talk of honesty, and boy does he talk of it, and the whole time he’s bringing down Othello simply by planting a few choice words into the Moor’s head. I think he might be Shakespeare’s best (worst) villain, he’s pure evil (“motiveless malignity”), he’s a ye olde internet troll – bitter, jealous and racist – with better lines. You do have to wonder how he gets away with it for so long, surely someone must see through him. But then, in this production at least, he does have the face of Rory Kinnear who looks like butter wouldn’t melt even in army fatigues and a suitably military strut. Kinnear is an exceptional Iago, but all the acting is, as has been well documented, immense. Adrian Lester’s Othello is as muscular as his pecs, his acting – in deed the whole production – is so physical (the NT’s PT must have been very busy). Fresh from playing nosy little reporter cub in Broadchurch, Jonathan Bailey is brilliant as goody-goody Cassio, who could, in the wrong hands, be a little sanctimonious. In Bailey’s he’s passionate enough to make good look, well, good. Desdemona isn’t the most three dimentional of characters, but Olivia Vinall highlights her vulnerability and youth; she’s heart wrenching in the final scene as Othello looms over her bed. I wanted someone in the front row to rescue her such was the force of her anguish. Othello is a bum-numbingly long play, but even I, who gets restless watching a YouTube video, was spellbound for all three plus hours of Nicholas Hytner’s taunt, passionate and dramatic production. Othello at the National Theatre runs until 5th October 2013. There are still tickets available here. 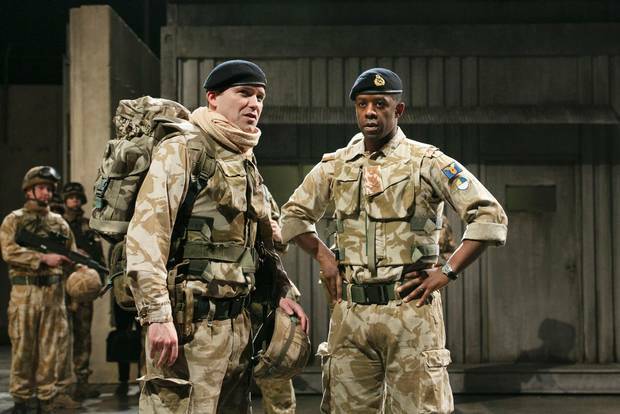 This entry was tagged adrian lester, jonathan bailey, national theatre, othello, rory kinnear, Shakespeare, Theatre, theatre review. Bookmark the permalink.